The Impatient Crafter : TastyLinks™ Saturday! Join the Beadalon Fan Page on Facebook! So thank you to everyone who has purchased both of the books, thank you to folks who’ve written up some great reviews and helped get some buzz going. 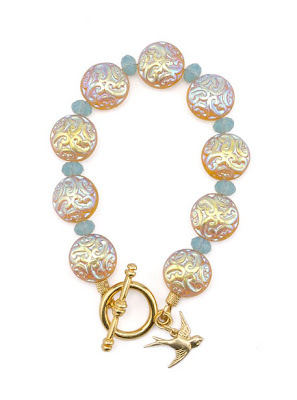 Kudos to my fabulous co-authors Fernando DaSilva (check out Nando's great post on pricing your jewelry line) and Katie Hacker (Katie's got a great post on Bead Artists against Breast Cancer)! We popped the cork on some bubbly last night and celebrated. This just confirms my belief that folks are hungry for inspiration and for creativity in these trying times. So if you’re a creative, take heart. I'll be riding on a horse drawn carriage in a fancy (and probably soggy due to the rain) hat this Sunday! My SIL invited us along to schmooze with the uber elite at a prestigious horsey event. As Joan Rivers would say, "Fohn, fohn, fohn...fohn." Just call me "Lovey" dahling. Super Linky Love thank you to the gals from ScaryCraft for featuring my Mixed Media pin last week! Check out their craftalicious blog! Ms. Jennifer Perkins did a very fun blog round up of crafty red heads this past week. She included yours truly, I'm a red head at heart no matter what color is on my locks. Thanks Jen! 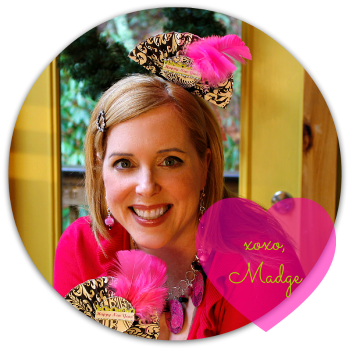 A Linky Love 411: The folks from Max and Chloe emailed me a hot tip on a great giveaway! They carry some really innovative costume and fine jewelry lines. Click here to enter a sweepstakes for a 500 dollar shopping spree! My friend Melanie Brooks of Earthenwood Studio did a gorgeous design for Rings n Things last week. She was inspired by my simple wire wrapped lava rocks to make a mind blowingly cool wrapped design integrating her beautiful keyhole pendant as a focal element. Plus I love how she showed you first hand how to be inspired by something and then make it your own. Great work, Melanie! Also check out her thoughtful post about artists’ rights and copyrights here. Vickie Howell Create customized cards out recycled fabric and keepsake images! The Crochet Dude Drew talks about his latest hook/needle find in an All Boye Review! Stefanie Girard's Sweater Surgery See how to make stitchless embroidered fabric from the cool new book: Fabricate by Susan Wasinger. Naughty Secretary Club Jen does a little painting, searches for vintages images and boils a pair of eyeglasses all in the name of creating a necklace with a little specs appeal. Cross Stitch at About.com Celebrate Cinco de Mayo with Connie's latest fun, fabulous, and did we mention FREE Cross Stitch pattern. CraftyPod In her latest podcast, Sister Diane interviews Sarah Hodsdon about the future of the design profession in a global, digital economy. Crafty Princess Diaries Go shopping in style with your own crocheted tote bag. The Crafty Princess shows off her latest finished fiber project. Craftside-A behind-the-scenes peek at a crafty world Craftside's got a crochet pattern for a pop art roll of toilet paper cozy, a detailed tutorial on how to make a photo based painting, a free dress silhouette template from the new book: Cloth Doll Artistry, and a couple of necklaces made from some very unusual recycled elements. Cathie Filian Cathie volunteered to make 40 centerpieces for an Awards Gala - Check out her trip to the flower district and step-by-step instructions on how to make the arrangements. Blisstree Arts Cyndi has rounded up all of her favorite posts on making background papers and fabrics for your projects. Aileen's Musings Aileen offer's another great Mothers or Father's day gift idea using more bottle caps! About Family Crafts Help needed: Looking for creative graduation decorations... Ideas anyone? The Impatient Crafter Learn how to make beaded wire circles with Madge!